Capt. Hawk was awarded the medals and decorations pictured above for his service in the US Army Special Forces, also known as the Green Berets. 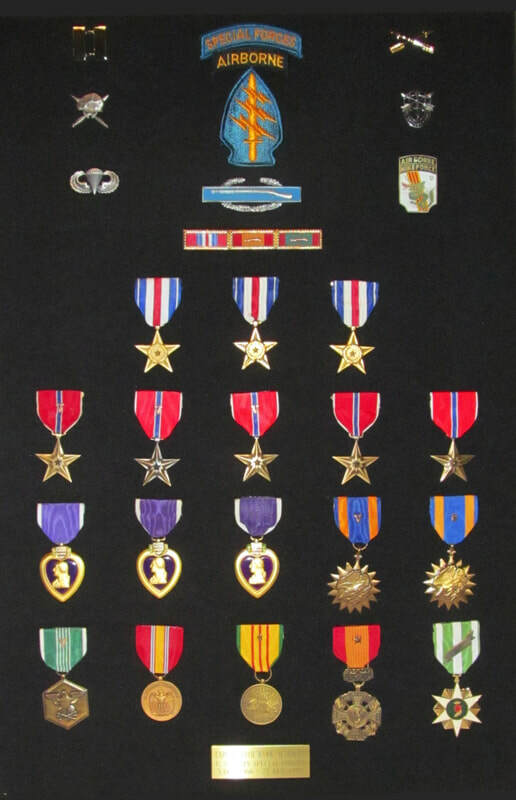 Among these are: 3 Silver Stars, 5 Bronze Stars, 3 Purple Hearts, and other awards and decorations listed below. Silver Star for Gallantry in Action – 3rd Award. See video of Award ceremony. 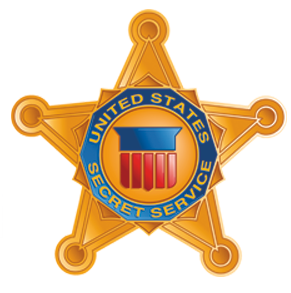 Bronze Star – 5th Award. Three with “V” device for combat valor and two for sustained outstanding service. Air Medal – One for meritorious service while in flight and one with “V” device for valor. 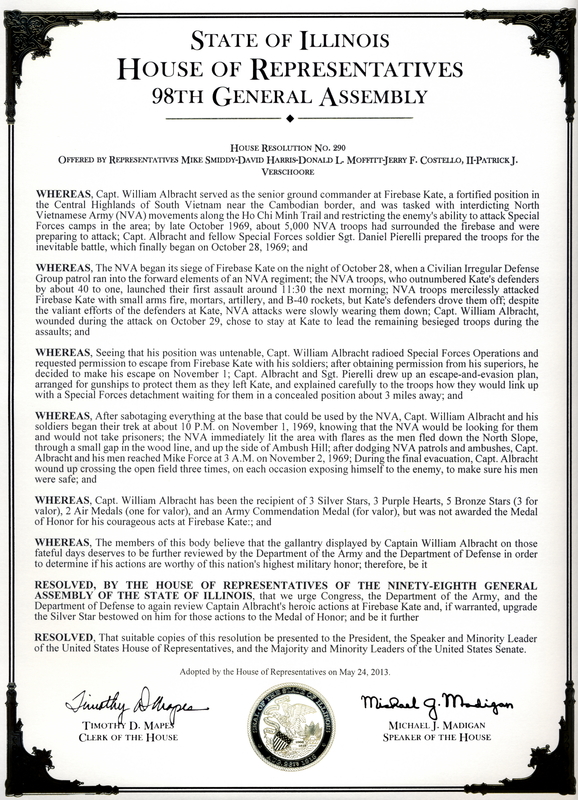 Army Commendation with “V” device for combat valor. Vietnamese Cross of Gallantry with Silver Star for gallantry in action. US Army - Army Valorous Unit Award – Awarded to Detachment B-20, II Mobile Strike Force. Republic of Vietnam - Vietnamese Civic Action Medal for outstanding achievements in civil affairs. 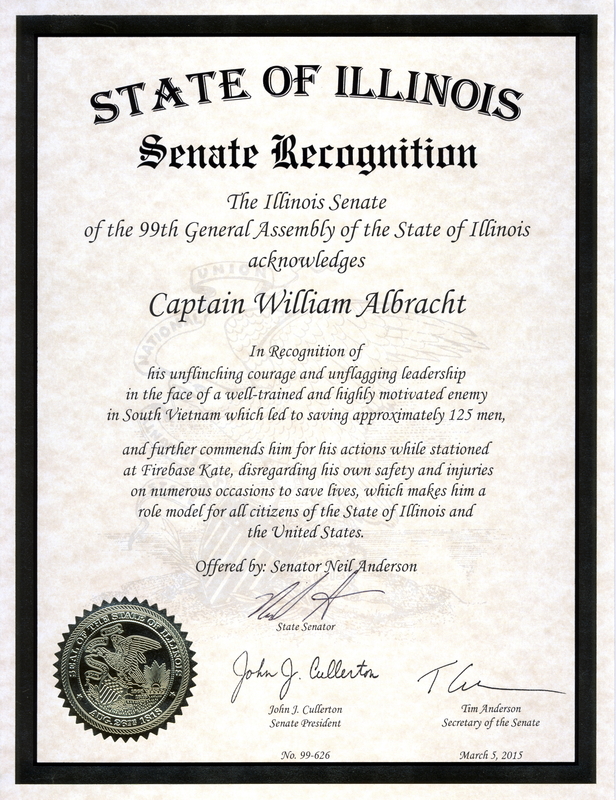 The State of Illinois Senate Acknowledges Captain William Albracht for "his unflinching courage and unflagging leadership...while stationed at Firebase Kate." See award. Illinois College Trustees Association 2018 Distinguished Alumnus Award.